It has got LSDJ sync, because it uses gwems lsdj pitch control as master clock . . . the red potentiometers determine the playback speed of the cassette deck, and the yellow potentiometer controls the clock speed. In other words, the sequencer he built controls both a Walkman tape deck and a Game Boy. Check out this audio sample or this one to hear what all this sounds like. 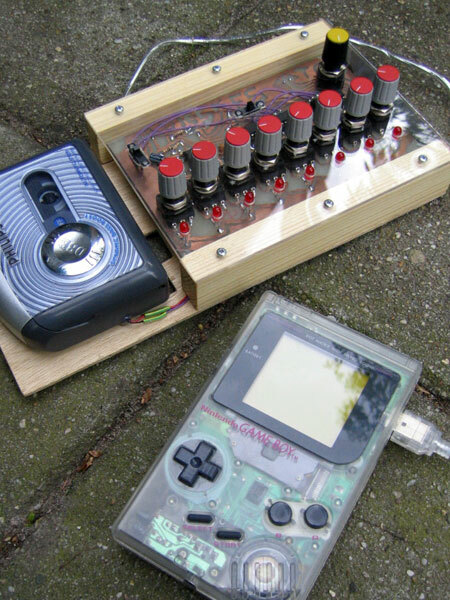 The effect is quite brilliant: a madcap tape deck scratch system with Game Boy music. Forget records and turntables. Tape is the future, man.